I can’t believe it’s been over a month, but on July 7th Grace, my stylist collaborator from Grace Professional Cosmetics and I had the pleasure of photographing Amy and Vee. It was a very warm, Massachusetts summer day, but they were good sports, and I think we all had a good time. At least I hope so! Also in the house that day was Liz, of Global Click Photography, who helped out by shooting some behind-the-scene shots. You're just going to have to go over to my special web site to see those though! Maybe next time she can do some video for us! Hint, hint!! More often than not, I am at a loss for something to write about in this space. There are some times though that I simply have work to show. Work to show off and to share, that I hope people will find compelling. I am constantly striving to do more significant work because I usually feel that it is competent but not that important. In any event, I do sometimes feel that it is good enough. Digressing... The week before last a colleague of mine, who has moved to Richmond, VA, came back to the Boston area to shoot a couple of weddings and we both wanted to reconnect and, I was hoping, get in a photo shoot. While she is a very talented and up-and-coming wedding and portrait photographer, she also loves to be in front of the camera. That quality in people usually comes through. This then, is one of those times in which I simply want to share some work with you. Nothing earth-shattering or terribly important from a photographic or story-telling sense, but just some fun photos of a friend on an enjoyable afternoon in the studio. I hope you agree! 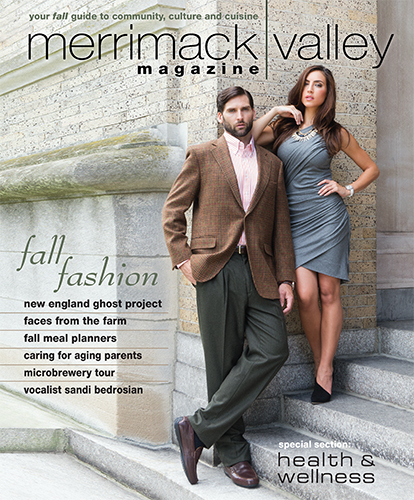 For this month's Merrimack Valley Magazine, I was part of a small army of creatives that were assigned to produce the magazine's fall fashion cover and cover stories. It was a fun day, with stylists, hair and makeup artists, creatives from the magazine, as well as photographer Meghan Moore and myself all working together with our two models to create something beautiful, interesting and hopefully informative. I'll show my cover shot here, but to see the rest of the spread, you will have to check out the magazine. Here though, are some of my favorites, both posed and unposed from that day at historic Coburn Hall, at the UMass Lowell campus in Lowell, Massachusetts.